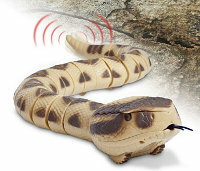 This is something your mom (or anyone else suffering from ophidiophobia for that matter) would definitely scream the moment they see it – the RC Snake which is a vast improvement over the traditional rubber snake toys that kids used to try to fool their parents with. It moves like the real thing, has scaley skin like the real thing, a flickering tongue like the real thing and it even has a terrifying rattle like the real thing. Because it’s radio-controlled, you can look all innocent while unassuming colleagues get terrorised by this realistic faux-predator. Its design is based on the largest and most dangerous real-life rattlesnake, the Eastern Diamondback, so the likeness is pretty remarkable, and the body is made up of segments, making the movement convincingly slithery. Not too sure what kind of hiding kids would get when they try to fool their parents with this £29.99 device, but it ought to generate a fair number of laughs from the office.